In a healthy physiological condition, the actions of parathyroid hormone, vitamin D and the calcium sensing receptor maintain extracellular calcium levels within a tight range . Disorders in calcium metabolism can lead to hypercalcemia, elevated plasma calcium levels or hypocalcemia, decreased plasma levels of calcium. Hypercalcemia has non-specific symptoms that if not recognized early could trigger patient deterioration and organ failure . Serum calcium levels more than 12 mg/dl can lead to multiple organ dysfunctions and if its level exceeds 20 mg/dl, can even be fatal . One of the responsible factors for hypercalcemia is decreased renal excretion of calcium which occurs through decreased glomerular filtration and increased renal tubular absorption of calcium [2,3]. On the other hand, other factors such as deficiency in active vitamin D or magnesium, or decreased secretion or action of Parathyroid Hormone (PTH) may result in hypocalcemia . Total serum calcium concentration less than 7.5 mg/dL in neonates and below 8.7 mg/dL in children are defined as hypocalcemia . Patients with renal insufficiency and those with extensive osteoblastic bone metastases have shown enhanced risk for hypocalcemia [6,7]. Hypoparathyroidism (HPT) is a disease caused by insufficient secretion of Parathyroid Hormone (PTH) and with unknown etiology. The reduced secretion of this hormone trigger to the deficiency in the synthesis of 1, 25-dihydroxyvitamin D and inhibition of calcium reabsorption in distal tubules and bone matrix which leads to hypocalcemia and hyperphosphatemia. Patients suffered with hypoparathyroidism commonly show cataracts, hair loss and dental abnormalities [8,9]. Hypophosphatemia, another disease associated with calcium metabolism, is caused by decreased intestinal absorption (such as phosphate binding antacids, malabsorption, and vitamin D deficiency) and excessive urinary excretion (including hyperparathyroidism, vitamin D deficiency, oncogenic osteomalacia, and familial hypophosphatemic rickets) [10-15]. Familial hypophosphatemic rickets is the common form of rickets that is inheritable and is characterized by features such as inappropriately low levels of serum concentration of 1, 25- dihydroxyvitamin D, renal phosphate wasting, short stature and radiographic evidence of rickets. Although the autosomal dominant hypophosphatemic rickets has been characterized, it is usually transmitted as an X-linked dominant disorder . Autosomal form of familial hypophosphatemic rickets is associated with hypercalciuria, a rare genetic disorder that is caused by a mutation in a gene that encodes sodium-phosphate transporter . Recently, it has been suggested, in mutant forms, osteoblasts and odontoblasts secrete a protein that enters the circulation and acts on the kidney . This abnormality leads to incoherent regulation between the production and the rate of mineralization of bone matrix, and subsequently the accumulation of poorly mineralized bone . Progressive renal damages lead to impairment of the excretion of body metabolic waste products and also, affect the endocrine functions of the kidney (secretion of vitamin D and erythropoietin) [19,20]. Renal phosphate wasting can be divided into three types based on the serum calcium level: primary hyperparathyroidism (high serum calcium level), secondary hyperparathyroidism (low serum calcium level), and primary renal phosphate wasting (normal serum calcium level) . Patients with renal failure represent various forms of oral and dental manifestation which of them gingival hyperplasia is one of the most widely documented . The oral and dental manifestations of the calcium metabolism disorders such as hypophosphatemic vitamin D resistant rickets have been well described in the literature [23-25]. Enamel and dentin defects, usually enamel hypoplasia, interglobular dentinal masses with variable degrees of calcification, large pulp chambers, enlarged pulp horns associated with thin enamel, dentin defects, defects at the dentin enamel junction, and fissures that may extend from the enamel to the pulp are oral consequences calcium metabolism deficiency [23-26]. Due to the close relation between calcium metabolism disorders and oral manifestations, in this study we aimed to investigate dental abnormalities in children with calcium metabolism disorders including hypoparathyroidism, nutritional rickets, hypophosphatemic rickets, renal osteodystrophy and osteogenesis imperfecta. The result of this study could be useful to prevent dental abnormalities or to find therapeutic solution for them. This cross-sectional study was performed on 100 patients who were suffering from calcium metabolism disorders and admitted at nephrology section, between 2005 and 2009, in Children’s Medical Center, Tehran, Iran. Patients that had a laboratory record of at least one total serum calcium level evaluated at any time during their illness met the inclusion criteria of our study group. Patients, who were suffering from calcium metabolism disorders, including renal osteodystrophy, hypoparathyroidism and different types of rickets, participated in this study. All of them transferred into dental clinic of Children’s Medical Center to pass dental exams and preparing OPG images if it was necessary. Also, prior patient’s files were used; their demographic information and dental problems were recorded on designed checklists. The study was carried out in accordance with the Declaration of Helsinki, the ethics committee of the Tehran University of Medical Sciences approved the protocols of the study. Qualitative data were analyzed and reported as frequency (%). All data were analyzed with IBM SPSS Statistics for Windows, version 21.0 (SPSS Inc., Chicago, Illinois, USA). As demography of patients has been presented in Table 1, the number of males is close to that of females. Also, the average of affected teeth has increased with age. Most of the patients were suffering from nutritional rickets and least of them from osteogenesis imperfecta. In addition, general oral health care was determined well. HPT: Hypo Parathyroidism; NR: Nutritional Rickets; HR: Hypophosphatemia Rickets; RO: Renal Oesteodisthrophia; OI: Oesteogenes Imperfecta. Table 1. Demographic feature of patients with calcium metabolism disorders. The number and percentage of dental abnormalities have been presented in Table 2. Gingivitis was at least frequency and its highest number was observed among patients with renal osteodystrophy with 20%. 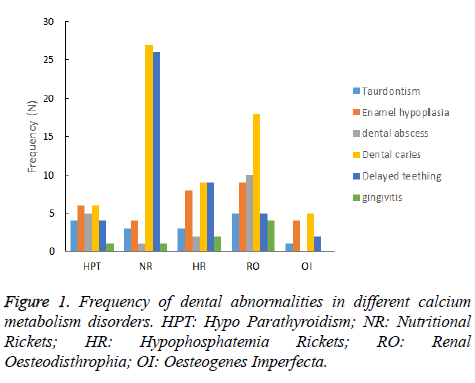 Taurodontism and dental abscess were not prevalent among patients and the highest abundance was observed among hypoparathyroidism group with 33.3% and 41.7% respectively. Enamel hypoplasia and delayed teething were more prevalent among patients with osteogenesis imperfecta and nutritional rickets, respectively. Dental caries was observed in 65% of patients which its occurrence was observed in 90% of patients with renal osteodystrophy. Note: Data are presented as frequency (%). Table 2. Representation of dental abnormalities in relation with different types of calcium metabolism disorder. Dental caries and delayed teething are more prevalent abnormalities in this study, and occurrence of them was more common among patients with nutritional rickets (Figure 1). Figure 1: Frequency of dental abnormalities in different calcium metabolism disorders. HPT: Hypo Parathyroidism; NR: Nutritional Rickets; HR: Hypophosphatemia Rickets; RO: Renal Oesteodisthrophia; OI: Oesteogenes Imperfecta. Hypercalcemia, as a calcium metabolism disorder, is the most common life-threatening metabolic complication and its prevalence is about 5%-20% in the adult population. In paediatric cancers it is equally as life-threatening but not as common, but must be corrected especially prior to induction chemotherapy . Also, acute leukaemia, which is the most common paediatric cancer, almost associated with hypercalcemia . Also defects in the secretion or action of parathyroid hormone result in hypocalcemia and a relative inability to excrete phosphorus . Nutritional rickets is mainly due to deficiencies of sunlight, malabsorption of vitamin D, failure to activate vitamin D or unresponsiveness tissue to vitamin D that can predispose the child to hypocalcemia. Since vitamin D is the initial regulator of phosphorus homeostasis, insufficient vitamin D synthesis or action, that cause to hypocalcemia, is usually accompanied by a decreased serum phosphorus concentration [28,29]. According to the results of present study showed that 42% of patients were suffering from nutritional rickets which was the majority among patients. Of these patients 64.3% and 61.9% were positive to dental caries and delayed teething which indicated to the relation between nutritional rickets and dental anomalies and the need for more attention children nourishment. Hard dental tissue alterations, mainly enamel hypoplasia and dentin defects, has been ascribed to Vitamin D dependent rickets . Vitamin D supplementation (daily 400 IU to 800 IU) has been recommended in patients with vitamin D deficiency. In addition, defects in the calcium-sensing receptors in the parathyroid glands and the kidney may also result in abnormalities in the serum concentration of calcium and patients with oncogenic osteomalacia should be cured by excision of the tumor causing the renal phosphate wasting [5,31]. Normally, conversion of vitamin D to the active form of 25- hydroxycholecalciferol or calcitriol occurs in the kidneys which are compromised in the condition of renal dysfunction, and supplementation with calcitriol has been recommended for the prevention or treatment of hypocalcemia . Renal osteodystrophy included 20 patients in our study which dental caries, again, is the major dental problem among them. Also, enamel hypoplasia and dental abscess were observed in 45% and 50% of patients, respectively, which was consistent with Jover et al. study . Enamel hypoplasia caused by alterations in calcium and phosphorus metabolism, that can affect both the primary and permanent dentition [20,34]. The severity of such hypoplasia is related to patient age at the time of presentation of these metabolic disorders, the duration of renal failure . In order to prevent the occurrence of multiple dental abscesses, local prophylactic measures have been proposed . Patients with significant renal insufficiency should benefit from oral 1, 25-dihydroxyvitamin D supplements . Also, prophylactic antibiotics have been recommended prior every invasive dental protocol . In addition, it has been suggested that patients with renal failure require special considerations in relation to dental treatment, not only because of the conditions inherent to the disease and its multiple oral manifestations, but also because of the side effects and characteristics of the treatments they receive . Hypophosphatemic rickets presents with significantly depressed phosphate levels and normal calcium levels, whereas 1, 25 (OH) 2 vitamin D levels are low or in the low normal range . In the present study, dental abnormalities such as dental caries and delayed teething, same as nutritional rickets and renal osteodystrophy, were prevalent. For treatment of hypophosphatemic rickets, vitamin D and hydroxylated forms of vitamin D have been used . Vitamin D is intimately involved in a wide variety of biologic processes, including calcium homeostasis, bone formation, and cellular differentiation [39,40]. In conclusion, our results showed dental caries and delayed teething as more dominant dental abnormalities among children with calcium metabolism disorders. Also, nutritional rickets and renal osteodystrophy were more prevalent disorders which both of them are associated with vitamin D deficiencies. Thus, as aforementioned, addition of vitamin D supplements to children’s diet could be an effective solution to prevent dental abnormalities. Murphy E, Williams GR. Hypocalcaemia. Med 2009; 37: 465-468. McKay C, Furman WL. Hypercalcemia complicating childhood malignancies. Cancer 1993; 72: 256-260. Oloomi Z. Acute lymphoblastic leukemia without circulating blasts presenting as severe hypercalcemia. Acta Medica Iranica 2007; 45: 76-78. Shaul PW, Mimouni F, Tsang RC, Specker BL. The role of magnesium in neonatal calcium homeostasis: effects of magnesium infusion on calciotropic hormones and calcium. Pediatr Res 1987; 22: 319-323. Se K. Hypocalcemia. Pediatr Endocrinol 2014; 257-294. Block GA, Bone HG, Fang L, Lee E, Padhi D. A single-dose study of denosumab in patients with various degrees of renal impairment. J Bone Miner Res 2012; 27: 1471-1479. Milat F, Goh S, Gani LU, Suriadi C, Gillespie MT, Fuller PJ. Prolonged hypocalcemia following denosumab therapy in metastatic hormone refractory prostate cancer. Bone 2013; 55: 305-308. Nakamura Y, Matsumoto T, Tamakoshi A, Kawamura T, Seino Y, Kasuga M. Prevalence of idiopathic hypoparathyroidism and pseudo hypoparathyroidism in Japan. J Epidemiol 2000; 10: 29-33. Ruff RL, Weissmann J. Endocrine myopathies. Neurol Clin 1988; 6: 575-592. Gaasbeek A, Meinders AE. Hypophosphatemia: an update on its etiology and treatment. Am J Med 2005; 118: 1094-1101. DiMeglio LA, White KE, Econs MJ. Disorders of phosphate metabolism. Endocrinol Metab Clin North Am 2000; 29: 591-609. Assadi F. Clinical decisions in pediatric nephrology: A problem-solving approach to clinical cases. Springer US 2007. Schmitt CP, Mehls O. The enigma of hyperparathyroidism in hypophosphatemic rickets. Pediatr Nephrol 2004; 19: 473-477. Jonsson KB, Zahradnik R, Larsson T, White KE, Sugimoto T, Imanishi Y. Fibroblast growth factor 23 in oncogenic osteomalacia and X-linked hypophosphatemia. N Engl J Med 2003; 348: 1656-1663. Tenenhouse HS, Murer H. Disorders of renal tubular phosphate transport. J Am Soc Nephrol 2003; 14: 240-248. Bergwitz C, Roslin NM, Tieder M, Loredo-Osti J, Bastepe M, Abu-Zahra H. SLC34A3 mutations in patients with hereditary hypophosphatemic rickets with hypercalciuria predict a key role for the sodium-phosphate cotransporter NaP i-IIc in maintaining phosphate homeostasis. Am J Human Genet 2006; 78: 179-192. Nesbitt T, Fujiwara I, Thomas R, Xiao ZS, Quarles LD, Drezner MK. Coordinated maturational regulation of PHEX and renal phosphate transport inhibitory activity: evidence for the pathophysiological role of PHEX in X-linked hypophosphatemia. J Bone Miner Res 1999; 14: 2027-2035. Balsan S, Tieder M. Linear growth in patients with hypophosphatemic vitamin D-resistant rickets: influence of treatment regimen and parental height. J Pediatr 1990; 116: 365-371.
de la Rosa GE, Mondragon PA, Aranda RS, Bustamante RMA. Oral mucosa symptoms, signs and lesions, in end stage renal disease and non-end stage renal disease diabetic patients. Med Oral Patol Oral Cir Bucal 2006; 11: 467-473. Davidovich E, Davidovits M, Eidelman E, Schwarz Z, Bimstein E. Pathophysiology, therapy, and oral implications of renal failure in children and adolescents: an update. Pediatr Dent 2005; 27: 98-106. Assadi F. Hypophosphatemia: an evidence-based problem-solving approach to clinical cases. Iran J Kidney Dis 2010; 4: 195-201. Proctor R, Kumar N, Stein A, Moles D, Porter S. Oral and dental aspects of chronic renal failure. J Dent Res 2005; 84: 199-208. Goodman JR, Gelbier MJ, Bennett JH, Winter GB. Dental problems associated with hypophosphataemic vitamin D resistant rickets. Int J Paediatr Dent 1998; 8: 19-28. Hillmann G, Geurtsen W. Pathohistology of un-decalcified primary teeth in vitamin D-resistant rickets: review and report of two cases. Oral Surg Oral Med Oral Pathol Oral Radiol Endod 1996; 82: 218-224. Murayama T, Iwatsubo R, Akiyama S, Amano A, Morisaki I. Familial hypophosphatemic vitamin D-resistant rickets: dental findings and histologic study of teeth. Oral Surg Oral Med Oral Pathol Oral Radiol Endod 2000; 90: 310-316. Witkop C. Manifestations of genetic diseases in the human pulp. Oral Surg Oral Med Oral Pathol 1971; 32: 278-316. Moayeri H, Oloomi Z, Sambo SA. A cross-sectional study to determine the prevalence of calcium metabolic disorder in malignant childhood cancers in patients admitted to the pediatric ward of Vali-Asr Hospital. Acta Med Iran 2011; 49: 818-823. Shaw N. A practical approach to hypocalcaemia in children. Endocr Dev 2009; 16: 73-92. Misra M, Pacaud D, Petryk A, Collett-Solberg PF, Kappy M, Drug. Vitamin D deficiency in children and its management: review of current knowledge and recommendations. Pediatrics 2008; 122: 398-417. Zambrano M, Nikitakis NG, Sanchez-Quevedo MC, Sauk JJ, Sedano H, Rivera H. Oral and dental manifestations of vitamin D-dependent rickets type I: report of a pediatric case. Oral Surg Oral Med Oral Pathol Oral Radiol Endod 2003; 95: 705-709. Drezner MK. Tumor-induced osteomalacia. Rev Endocr Metab Disord 2001; 2: 175-186. Buonerba C, Caraglia M, Malgieri S, Perri F, Bosso D, Federico P. Calcitriol: a better option than vitamin D in denosumab-treated patients with kidney failure? Expert Opin Biol Ther 2013; 13: 149-151. Jover CA, Bagan JV, Jimenez SY, Poveda RR. Dental management in renal failure: patients on dialysis. Med Oral Patol Oral Cir Bucal 2008; 13: 419-426. Davidovich E, Schwarz Z, Davidovitch M, Eidelman E, Bimstein E. Oral findings and periodontal status in children, adolescents and young adults suffering from renal failure. J Clin Periodontol 2005; 32: 1076-1082. Kawakami M, Takano-Yamamoto T. Orthodontic treatment of a patient with hypophosphatemic vitamin D-resistant rickets. ASDC J Dent Child 1997; 64: 395-399. Bettinelli A, Bianchi ML, Mazzucchi E, Gandolini G, Appiani AC. Acute effects of calcitriol and phosphate salts on mineral metabolism in children with hypophosphatemic rickets. J Pediatr 1991; 118: 372-376. Brandi L, Egfjord M, Olgaard K. Pharmacokinetics of 1, 25 (OH) (2) D (3) and 1alpha (OH) D (3) in normal and uraemic men. Nephrol Dial Transplant 2002; 17: 829-842. Miller WL, Portale AA. Genetics of vitamin D biosynthesis and its disorders. Best Pract Res Clin Endocrinol Metab 2001; 15: 95-109. Hewison M, Zehnder D, Bland R, Stewart PM. 1alpha-Hydroxylase and the action of vitamin D. J Mol Endocrinol 2000; 25: 141-148.